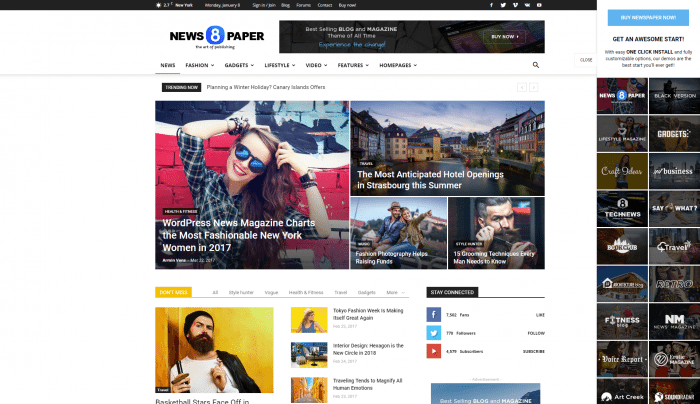 Newspaper is the best WordPress theme for the publishing industry and the best-selling blog, news, and magazine template of all time. Developed by tagDiv, a Power Elite Envato author, Newspaper comes packed with premium features, amazing designs, a one-of-a-kind live editing tool, and what I love the most is that you don’t have to code a single line. With an elegant and responsive interface, this theme lets you build your ever dreamed website to behave the same on any screen device. For anyone who wants to give their site a quick start, there are predefined ready-made demos, which come bundled with Newspaper and can be easily imported with a single click. There are over 48 demo designs to choose from, like the “Lifestyle Magazine,” “Gadgets,” “Travel Blog,” “Church Mag,” “Baby Blog,” “Health Journal,” “Dental Studio,” “Heaven Spa,” and more. I’ve mentioned above that the Newspaper theme includes a powerful frontend editor. The handcrafted tagDiv Composer is the first-page builder created for the news industry, and it’s based on a row and column system. It has dedicated elements, and you have over 100 items to drag and drop on the frontend of your website watching every change instantly. Even more, there are multipurpose shortcodes that bring a plus of visual appeal to your pages. With this template, you don’t need coding skills or to spend an impressive amount of money to hire a developer to create a blog, news or magazine website. It’s so simple, yet so interesting to get creative and build your site in no time. With Newspaper, everything comes in handy and is right where you need it. An intuitive Theme Panel with all the settings that you can apply globally or individually, predefined header & footer styles, post layouts, ad system, translation panel, the mobile theme, social networks, and more. For example, if you would like to monetize your site, you can place advertisements in several areas of your website. Newspaper is Google AdSense ready and also supports HTML banners. One of the most used ways to present stories is to showcase great amounts of pictures. The Newspaper theme lets you publish images through the beautiful tagDiv Slider Gallery, which displays every pic within a lightbox. You have optional plugins you can install – tagDiv Multi-Purpose, Revolution Slider, tagDiv Mobile Theme, and Visual Composer. Choose a demo and import it with a single click! 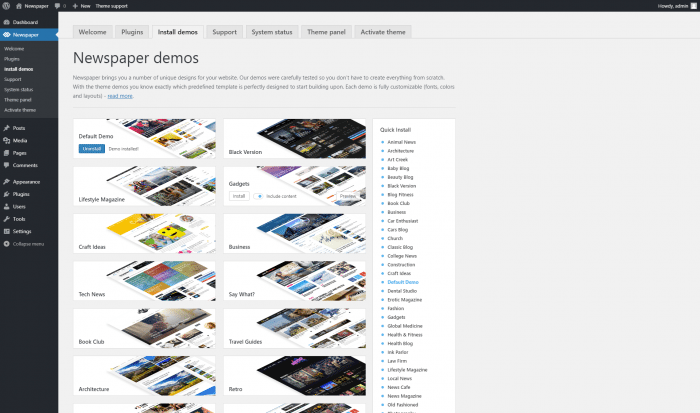 This action brings you the layout, pages, posts, and the settings for that specific demo design. Start filling up the pages and posts with your content, and the desired images. Elegant, Responsive and Retina Ready Interface. Ready to import demos: 48+ beautiful and various designs. Frontend Page Builder – tagDiv Composer. More than 100-page elements you can drag and drop, mix and match. Choose from 25 Blocks, 12 Big Grids, 10 Fullwidth Big Grids and a Big Grid Slide, and even more items. Includes the tagDiv Multi-Purpose plugin and 22 new content elements to help you create landing pages using multipurpose elements. Furthermore, it comes with new demo designs, such as the SmartApp, Restro, Dental Studio, Technology Hub, Law Firm, Construct, Showcase, Heaven Spa, and Ink Parlor. Full-Width Pages and Wider layouts. An image or a video can be set as a background using the parallax scrolling effect. Overlay menu page template, empty page template. 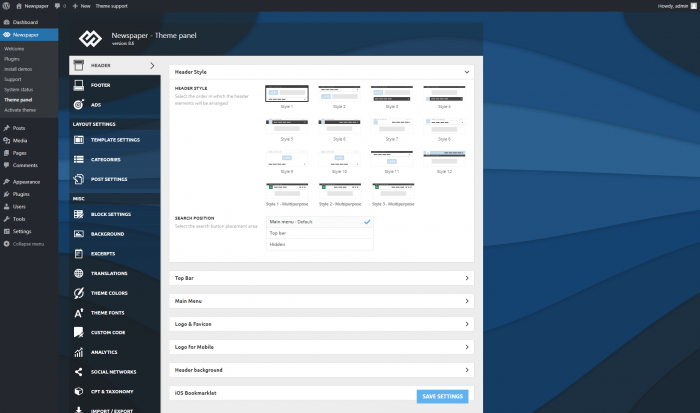 Built-in Theme Options panel with dedicated sections for: Header, Footer, Ads, Layout, Block, Background, Translations, Typography, Google Analytics Code, Social Networks, and others. Ad System – the theme is compatible with Google AdSense, but also supports banner adverts. There are 19 areas where you can embed the desired ads. 14 Post Styles to choose from, and individual settings for each post. Video Posts – YouTube, Vimeo, and Dailymotion custom playlists. A Review system that can be shown using stars, percentage, or points, on any post. You can use articles, pictures, and titles to build smart lists that will quickly catch the eye of the visitors. Social Sharing buttons – Behance, Blogger, Delicious, Deviantart, Digg, Dribble, Evernote, Facebook, Flickr, Forrst, Google+, Grooveshark, Instagram, Lastfm, Line, Linkedin, Mail, MySpace, Pinterest, Reddit, RSS, Share, Skype, Soundcloud, Spotify, Stackoverflow, Steam, StumbleUpon, Twitter, Tumblr, Telegram, VKontakte, Vimeo, Vibe, and more. Premium widgets: Weather, Exchange, Social Counter, Instagram, Pinterest, Slide, Image Box, Text with Title, Author, Ad Box, and many more. It has a built-in Mobile Theme. Included Plugins: tagDiv Composer, tagDiv Multi-purpose, tagDiv Social Counter, Revolution Slider, tagDiv Mobile Theme. The theme authors still let their users utilize the Visual Composer plugin (which comes bundled with the Newspaper theme), but this doesn’t work simultaneously with the tagDiv Composer. The page builders work independently of each other, with their own specifications. Compatible Plugins: WP Super Cache, Contact Form 7, bbPress, BuddyPress, Font Awesome 4 Menus, Jetpack, WooCommerce, WordPress SEO by Yoast, WordPress User Avatar, AMP by Automattic. Besides the included translation panel and the 90+ ready language translations, Newspaper is compatible with the WPML plugin so that you can create multilingual websites. Newspaper is probably built with the idea of “Do It Yourself,” in mind and I’ve enjoyed playing with the theme, as it gave me the power to change everything without using a single line of code, and focus on my creativity. Newspaper in five words: Dynamic, Stylish, Performant, Versatile, Fast. 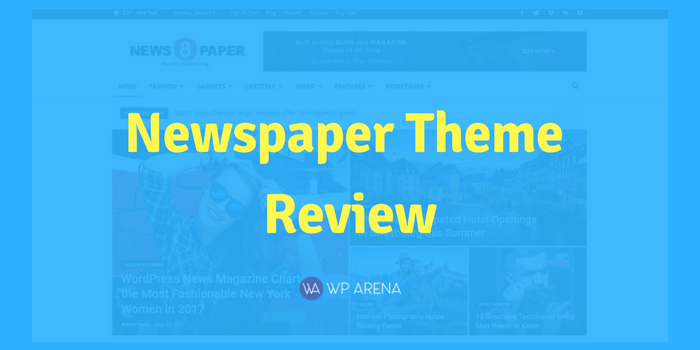 There’s no doubt that this is the best blog, news, and magazine WordPress theme you can find in the industry. With the help of a great support team, video tutorials and documentation, Newspaper is a powerful theme you really have to try! With constant and free updates, the developers are improving this product from day to day, making it even more amazing. Restora is a premium multi-purpose and professional HTML template for Restaurants, Cafe, Cakes, Cooking, Bakeries, Sweets or Food Business. The template is fully responsive and mobile friendly to look great on multiple devices and it’s also retina ready. 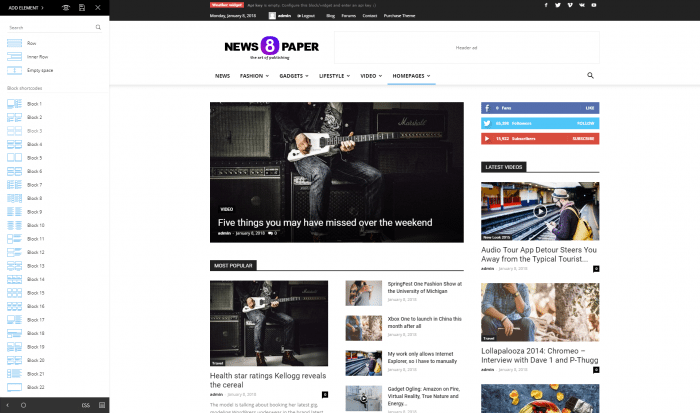 I’m going to buy Newspaper theme, can you tell me please, can I use promo code for any discount?